Mark Lynas has certainly put together a well-researched book, containing over 400 references from scientific works within its 300 pages. 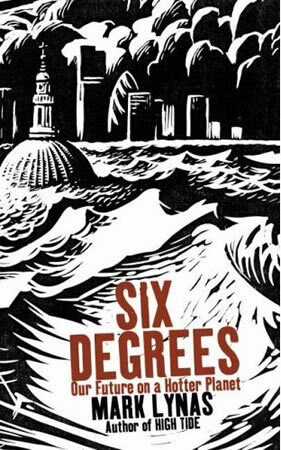 In Six Degrees: Our Future on a Hotter Planet, Lynas explains what is already happening to our planet as the result of it warming up 10C due to carbon induced global warming, and what is likely to happen if emissions continue to rise unabated. Lynas sets this out in a simple structure of six chapters, each dealing with the consequences of a rise in the global average temperature of up to one degree, two degrees and so on up to six degrees. Reading the book it should be remembered that the Intergovernmental Panel for Climate Change prediction for their business as usual scenario is a 5.80C increase in global average temperatures. It is gripping, even scary reading, as Lynas exposes the evidence of how the world will change as temperatures rise. Millions will face famine from increasingly severe droughts which will leave people with only one choice left to them - pack up their belongings and move from Central America up into the United States or from Africa up into Europe. Lynas produces a useful summary of the relationship between rising temperatures, atmospheric levels of carbon dioxide and when emission will need to peak to limit temperatures rises within particular ranges. It shows that if we are to avoid dangerous carbon cycle positive feedbacks mechanisms kicking in such as the collapse of the Amazon rainforest, we will need to limit the rise in global average temperatures to between 10-20C. This would mean limiting atmospheric carbon levels to 400ppm, with global carbon emissions peaking by 2015, and a 90% cut in emissions by 2050. This is in stark contrast to New Labour's ambition of only limiting atmospheric carbon levels to 550ppm which, as Lynas points out, could result in global average temperatures rising by 40C, leading to events such as the Arctic tundra thawing, accelerating carbon and methane emissions. Lynas' proposals on what needs to be done, however, are confused. While he recognises that part of the problem is "societal", he does not explore in any detail the type of society we live in, which is a capitalist one, a social and economic system that has seen carbon emissions rising throughout its 200 years of development. Lynas acknowledges that people are pressured into conforming to a "high-fossil-fuel-consumer lifestyle" and it might be "unfair to blame individuals for not facing up to climate change when the whole weight of the economy and society works effectively in preventing them from doing so". Rather than investigating why capitalist society demands greater and greater consumption of commodities, Lynas limits his analysis to "societal dysfunction" and the need to somehow reverse social pressures, without explaining how. Although Lynas admits a different sort of society is needed, he offers no suggestions as to how it might look. This is in contrast to Running a Temperature, which suggests a plan to move society on from its current form of globalised capitalism. It proposes a form of local stewardship, but which acts in the interests of global society. It starts the debate on what needs to be done to create the type of society that will realign itself, scientifically, with nature to avert the catastrophe Lynas illustrates so graphically.